Truck Driver Negligence - The Gerardo Cantu Law Firm, P.C. Filing a successful truck accident lawsuit depends on knowing who is responsible for your injuries. The personal injury attorneys at The Gerardo Cantu Law Firm, P.C., can help. Our firm has more than 12 years of experience handling truck accident cases for clients in Houston, Texas, and the surrounding areas. We know how to identify truck driver negligence and other actions that can lead to serious trucking accidents. Contact us today so we can evaluate your case. 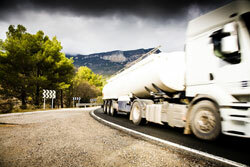 Was Your Accident Caused by Truck Driver Negligence? However, sometimes it is not just a distracted driver who is responsible. A trucking company’s failure to enforce log books or to hire safe drivers can also lead to semi-truck accidents. Our Houston truck accident lawyers will look at all the facts of the case to determine who is at fault for the accident. We will hold multiple parties responsible if the case allows. Our goal is to obtain the best possible results for you. Contact us for a free consultation: Call us or send us an e-mail. Get in touch with us today to discuss whether your accident was caused by truck driver negligence.